The Gospel of Mark from the NIV Adventure Bible is the perfect evangelistic Scripture portion to give away at VBS, Sunday school, Easter, Halloween, and other outreach events. Now available in full-color throughout making exploring God's Word even more fun! 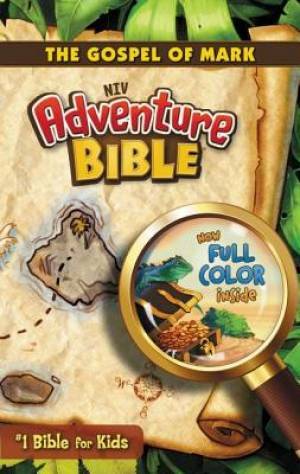 NIV, Adventure Bible: The Gospel of Mark, Paperback, Full Color by Lawrence O. Richards was published by Zonderkidz in June 2013 and is our 6689th best seller. The ISBN for NIV, Adventure Bible: The Gospel of Mark, Paperback, Full Color is 9780310739876. Be the first to review NIV, Adventure Bible: The Gospel of Mark, Paperback, Full Color! Got a question? No problem! Just click here to ask us about NIV, Adventure Bible: The Gospel of Mark, Paperback, Full Color.